← Krrish 3: Hrithik to the rescue again! Hues, so many hues, red crowned their queen here, dominate every single frame of Goliyon Ki Rasleela Ram-Leela. 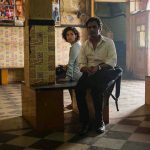 Seductive, screaming, sly there’s enough colour in this one film to both — compel you to pack your bags at once and set off exploring Gujarat’s sweeping landscape or flee from its pulsating sound of blood-thirsty bullets and bottles. Sanjay Leela Bhansali’s pays ode to one of his favourite shades with bang, bluster (and blips) in a Romeo and Juliet-inspired fantasy about warring clans and star-crossed darlings set in a universe that is meticulously choreographed for cinematic perfection. 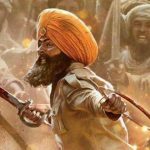 It’s a familiar, much-adapted scenario — of rage, rivalry, romantic rebellion and immortal third act witnessed in films like Mansoor Khan’s Qayamat Se Qayamat Tak and more recently, Habib Faisal’s Ishaqzaade. Ram-Leela’s temperament is somewhat closer to Ishaqzaade but its soul wears the mark of extravagance one has come to expect from Bhansali’s school of drama and dynamism. Moreover, where Ishaqzaade faltered most – dumbing down its feisty heroine’s spirit, Ram-Leela devises a peculiar twist just to uphold it. Its lavish visual spread is filled with moments of thrill, ingenuity and splendour courtesy Wasiq Khan’s dazzling art design and Ravi Varman’s blazing camerawork. Together, they mount a marvel out of Ram-Leela’s bold dalliance and Bhansali’s festive style making its first half a stupendous dream to behold. Alas, those fine flaws that were previously (voluntarily) overlooked to partake in Bhansali’s eternal carnival of song and dance surface far too prominently in the second half to flout. Every single sweeping romance on screen depends on the two actors to convince us they are madly in love and truly cannot get on without another. 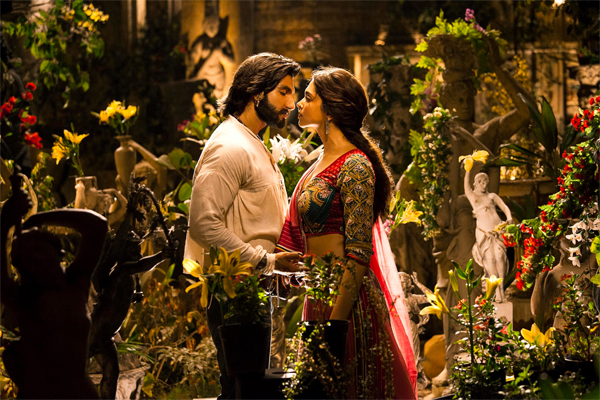 Ranveer Singh’s Ram and Deepika Padukone’s Leela demonstrate a personal connection and physical comfort in enacting their furious intimacy. Chemistry, however, is a special word. Let it not be concerned with its biological connotations alone. It was felt in abundance even though the characters didn’t share a single frame together in The Lunchbox. This love-at-first-sight fallacy needs something more than burning expressions of lust to underscore its potency. It needs growing space and dialogue — wonderful, quotable dialogue. Romeo and Juliet enjoyed that privilege thanks to Mr Shakespeare. Ram and Leela are left with cheesy lines, the kind you are spammed on SMS with, the kind you reflexively delete. Apart from its clunky writing (Woh lover toh hum killer) teeming with sexual innuendoes, Bhansali’s fondness for indulgence and theatrics leads to frequent awkward displays of revolting chauvinism and contrived melodrama. As a result, the strategically planned *epicness* of Ram and Leela’s romance is diluted in the excessive politics of endless revenge and mindless honour, which only takes a breather for one needless song after another (Priyanka Chopra stars in one such tantalising number). Still, it’s ever so watchable for Deepika Padukone. If ever there was any room for doubt, Deepika cancels it with her recently acquired aura. She embodies the lack of reason, the all-consuming ‘junoon,’ the bitterness, the sauciness, the arrogance that constitutes Leela so effectively, the film could well be titled after her. Only her. As for the rest, Ranveer Singh’s energy is unquestioned but he plays Ram like a rambunctious tapori who appears to be channeling Govinda in wardrobe, Madhuri Dixit in dance, Dharmendra in anger and Amitabh Bachchan in comedy. Supriya Pathak does a lady ogre in all her jeweled, kohl-ed glory with relish. If Agneepath makers ever decided to do a prequel, she’d be perfect to play Kancha Cheena’s mother. Richa Chadda doesn’t have a big role but she owns the scenes she walks in with her inbuilt fire. Gulshan Devaiah does well as a wily troublemaker. There’s Raza Murad too. His presence somehow only highlights the silliness of the premise even further. What began on a staggering note with stunning opening shots and rousing bottle-shooting sequence between boastful rivals somewhere is led astray in a Bhansali-constructed chaos of confused priorities and half-hearted romanticism. This entry was posted in Columns & Reviews and tagged bollywood, deepika padukone, goliyon ki rasleela ram-leela, musical, ranveer singh, romeo and juliet, sanjay leela bhansali, supriya pathak. Bookmark the permalink.